I'm always looking for new and creative ways to recycle and reuse. 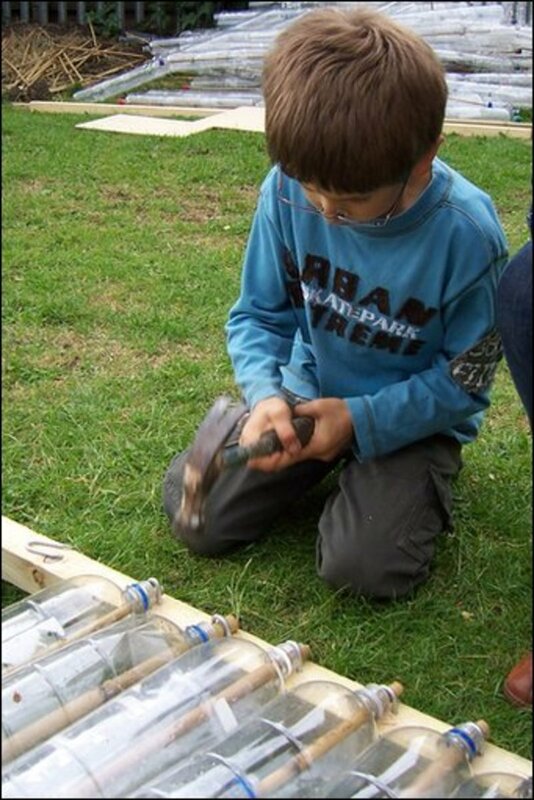 Here is a step-by-step guide for building a plastic bottle greenhouse for those of you with the time and patience to collect enough empty plastic bottles to construct one. Making this type of greenhouse is relatively cheap and easy, but it is also a bit of an undertaking in terms of labour and time, especially if you've never done anything like it before. It does make a great project for a large group or community or school organisation, but you can do this on your own, too. There is no reason why everyone should not have a wonderful PET plastic construction in their yard. Remove and recycle the lids. Wash and remove the labels from the bottles (not necessary, but it ends up looking nicer). Use scissors to cut off the bottom of each bottle. Plan your sizing. I recommend two 6' long walls facing two 8' long walls. 7' or 7.5" high should suffice. Fix four posts into the ground. These will be the corners of the greenhouse. Treated 4” x 4” or 2" x 2" posts cemented into the ground works great. All the PET greenhouses I have seen have had a wooden frames, which is not terribly "green" since trees will be sacrificed. You could use recycled lumber or metal pipe, but I am still trying to think of other, greener alternatives. Next, build frames for three of your walls: the two long ones and one of the short ones. (The other short wall will contain your door: See those instructions below.) Treated 2” x 2” lumber with mitred corners screwed together should do the trick. Lay them on the ground for steps #7- 9. 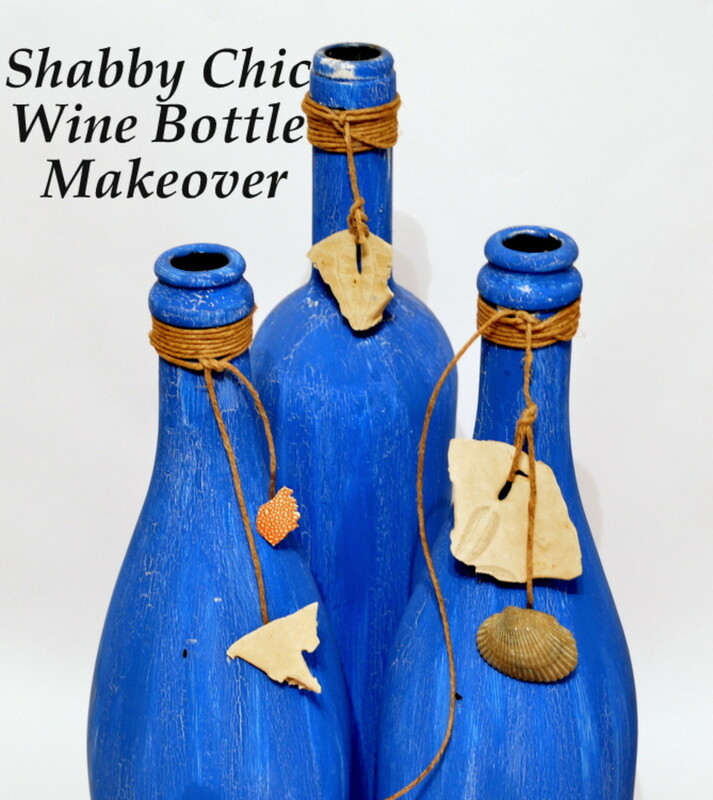 Select and cut your material to string the bottles onto and use as the sides of the structure. This can be bamboo canes, dowels, lengths of stick, or wire— but whatever you choose, it needs to be slim enough to feed through the bottle openings and long enough to span from the ground to the top of the wall frame. Thread the bottles through whatever material you choose to use to hold them in a line. The plastic bottles will fit into each other and interlock. Then nail each cane or stick to the top and bottom of the frame. Nail this frame—now full of plastic columns—to the posts you set in step #5. For the roof, construct a simple gable frame (no eaves necessary) with 2" by 2" lumber. Screw triangular gables to your posts and use vertical supports to support the top of the triangles. Then lay a beam vertically to connect the two triangular gables. The sloped sides of the roof can be filled with plastic columns the same way you made the walls. What Kind of Plastic is PET? PET stands for polyethylene terephthalate, which is the type of plastic approved worldwide for bottles used for drinks. I suggest putting the door on one of the shorter walls. So if your structure is 6' by 8, use one of the 6' walls for the door. Connect the two posts you set in step #5 above with a vertical beam, then build two frames to fill that section instead of the one you used to create the other walls. Each frame will be approximately 3' wide, but factor in some room for movement. After you've attached the columns of plastic bottles to each frame, nail one to the structure and affix hinges to the other one and attach it to the post. Don't forget to measure carefully and make your door smaller than the inside of the frame to let it to move freely... even if it eventually warps or sags a bit. It's cheap to construct. You will need approximately 1400 empty 2 litre (40 oz) plastic bottles to build a greenhouse that is 8' x 6'. If you don't have enough bottles saved up, you can collect them from neighbours, friends, hotels, bars, and restaurants in your area. It holds heat and keeps seedlings warm. The temperature inside this greenhouse will be about 10°C higher than the weather outside. That is a huge difference, and it should certainly lengthen the growing season for many plants, no matter what climate you live in. It is self-watering. Because there are gaps between the bottles, heavy rain can certainly penetrate into the structure. This is a huge time-saver for greenhouse growers. Also, rainwater is always better for your plants than tap water. It saves yet more plastic waste from the landfill. It goes without saying that if everyone saved those plastic PET bottles for constructions like greenhouses, there would be less plastic cluttering up landfill sites. It is cheap and easy to repair. You can simply replace any plastic bottle that has broken or been damaged. All the bottles are hooked onto either wire or a cane or sticks, so all you need to do is unhook the line, slide out the bottle, and replace it with a newer one. It is sturdy and can withstand strong winds. Plastic bottles can't get blown away when they are pinned into place. The strength of your structure will depend entirely on how well the lines of bottles are anchored. 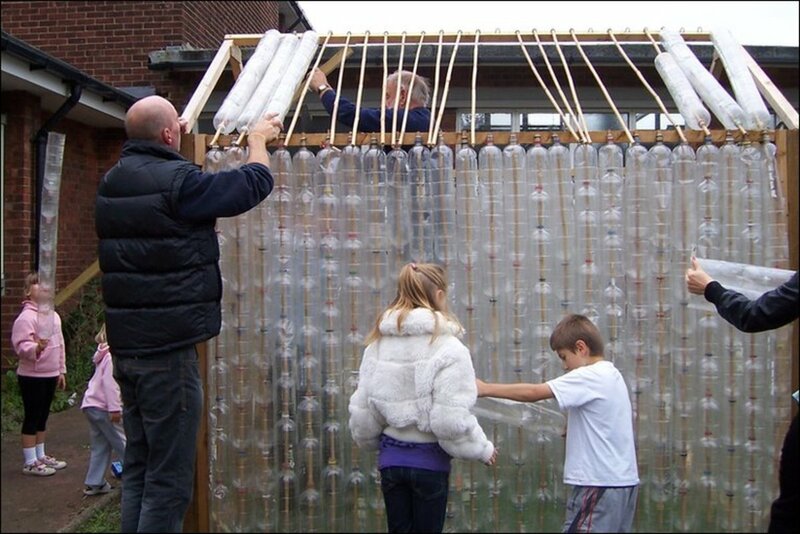 How Many Plastic Bottles Will You Need to Build a Greenhouse? 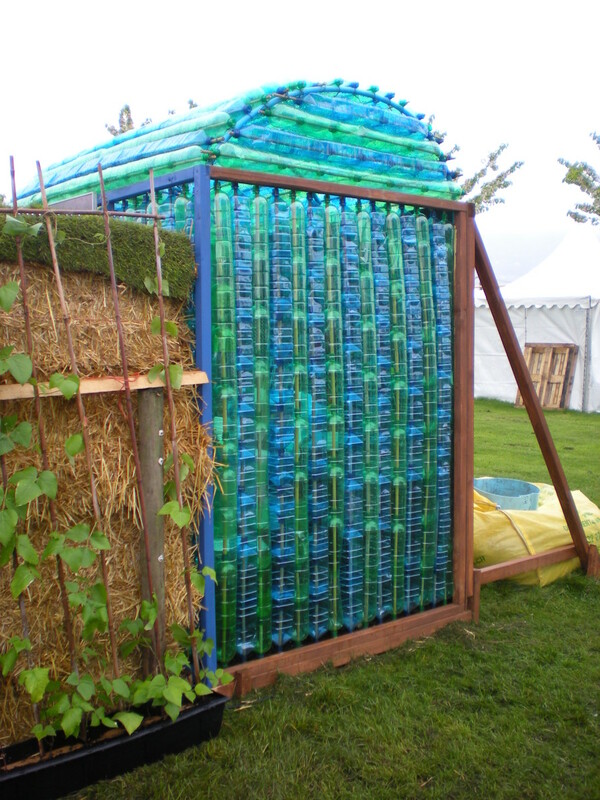 You will need approximately 1400 empty 2 litre (40 oz) plastic bottles to build a greenhouse that is 8' x 6'. 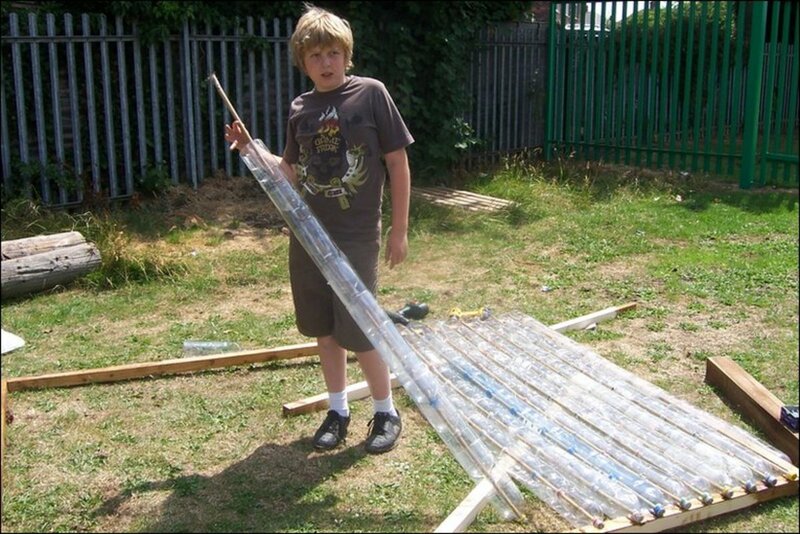 How Should You Attach the Columns of Plastic Bottles to the Frame? Use a U shaped nail or staple or fence stapling wire that is wide enough to accommodate the wire, dowel, or canes you're using. Can You Make This Greenhouse Without the Dowels or Canes? 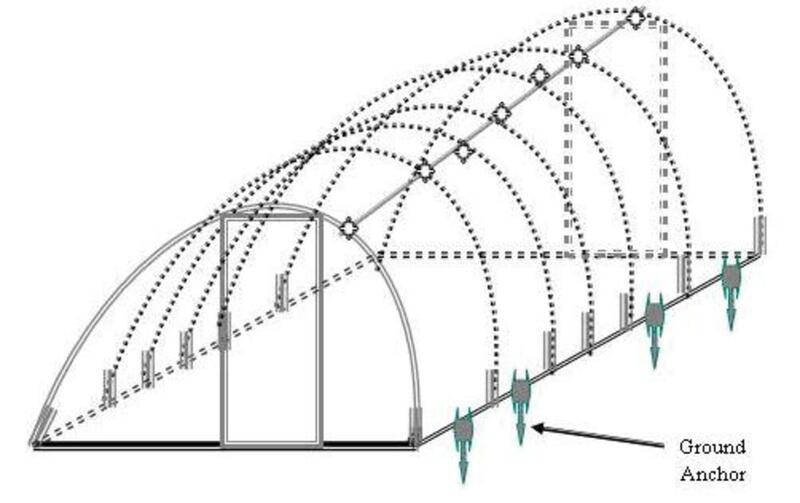 Another way to build your greenhouse would be to interlock all the plastic bottles together, one on top of the other, but without a dowel or cane as central support. Then wires can be strung both inside and outside the greenhouse to hold the bottles in position, as shown in the photo below. You will note that, in this project, the lids were left on the bottles. There was no need to remove them, as nothing was being threaded up through the bottles. I must admit I quite like this idea as it means one less place for insects to enter and make themselves at home. 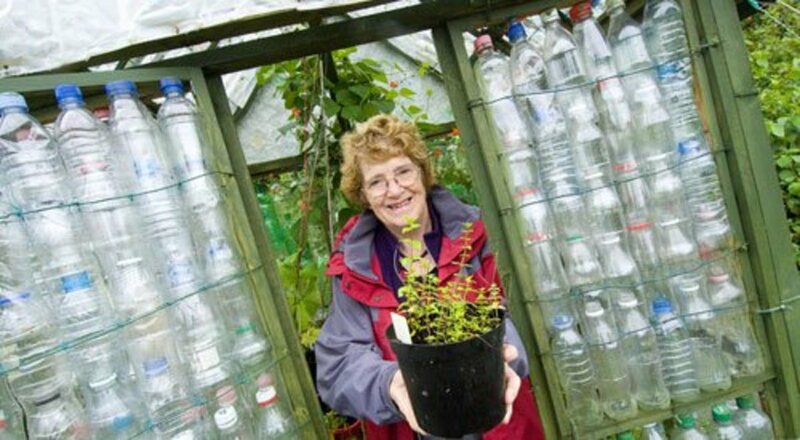 This photo shows the plastic bottle greenhouse built by 68-year old Linda Woollard as part of a university project. She used a framework of wire to hold the plastic bottles in place. Plastic bottle greenhouses can also be insulated to keep out cold draughts and protect from rain. Recycled bits of bubble wrap do the job really well. How Long Will This Type of Construction Last? 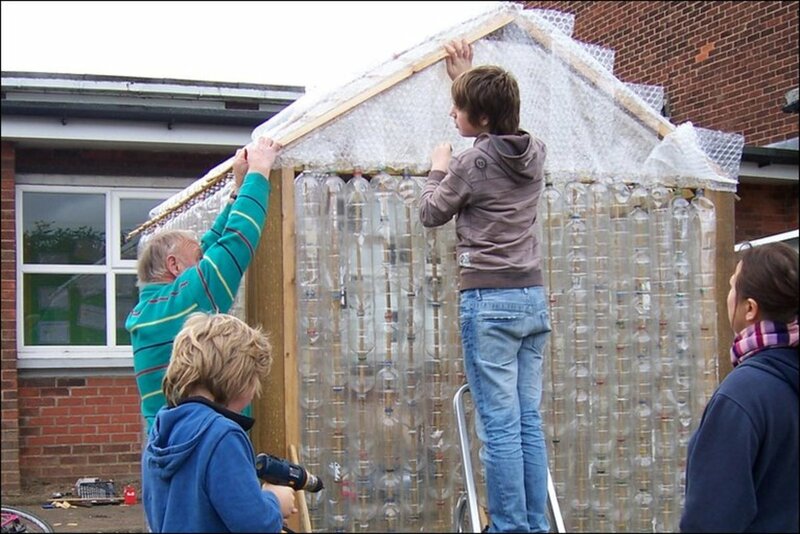 In Europe, building plastic bottle greenhouses has become a popular pastime for many. The plastic bottles stand up well under a hot sun, but they will degrade eventually. 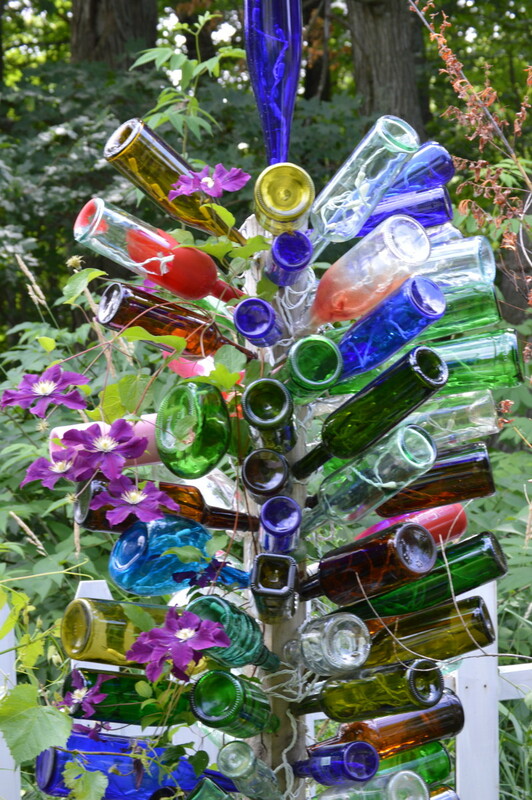 When it does, however, it's not hard to unpin the stack of old, degraded bottles and replace them with newer ones. How is the roof made??? I love the idea of using these bottles it teaches how to use a material that is not recycleable and put it to good use and help save our planet. I hope more people that this and find a purpose to teach how to use these bottles to help build sonething in your town that everyone could benifit. It woukd be great if we could build a large homeless shelter or two in every town , it would be greart to have the homeless build this shekter and teach them some skills to teach others and we save our planet by finding use of these bottles. This looks like an awesome idea. I plan to start with making a wall to protect my poor plants on my roof from the wind. Also, thinking about a dog house and then a greenhouse. I live in tropical Taipei. I saw some discussion about heat melting the bottles. I would think that would be a super big problem here and that's why I'm starting small. What about painting the bottles with something to help reflect the sunlight?? Anybody try something like that? can you use gallon milk jugs in place of 2 liter bottles? First and foremost thank you for the great idea. I was wondering how to contact rachel Smithh who lives in Arizona? I also live in Arizona and would like to know what she found out on the sun and these bottle greenhouses. 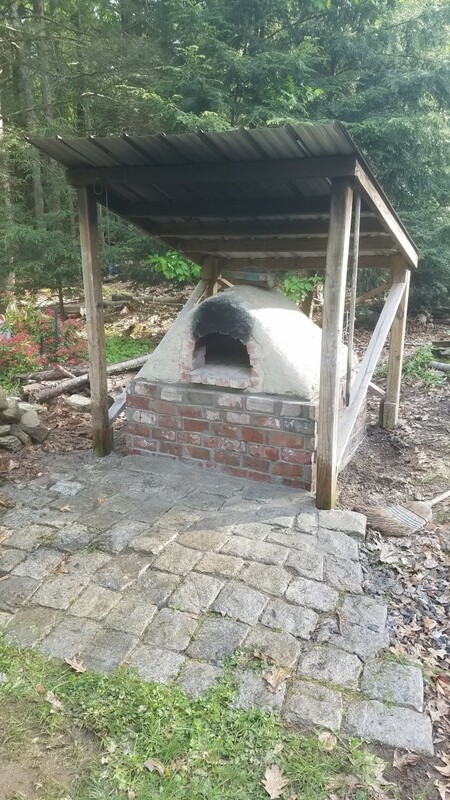 I would also like to know since I am building a walipini, and I would only need the roof portion of this concept, if anyone has thought of cutting the bottles in half lengthwise so fewer bottles are needed? Is there a reason I guess the question I need to ask is why the bottles are always kept whole? I never really see answers to questions here is there a reason for that also lol just full of questions today sorry. I heard that plastic bottles labeled 1 (PET or PETE) are only safe for a single use. When exposed to oxygen or high temperatures, including sun heat, such a bottle will discharge toxic substances that get into the water will those bottles also discharge toxic substances if used for a greenhouse made from plastic bottles? One of the above headings says 'It saves more plastic from going into landfill sites'. I live in Great Dunmow, Essex and our plastic bottles go into our green recycling bin along with paper, cardboard, tin and glass. Does this not happen in other parts of the country? However, we have a community group who are going to build a greenhouse so at the moment ours are taken to the Library which is the collection site. Wont stand up well to Texas heat. One year the spark plug wires melted on our riding mower. We were not even using it, the heat killed the grass and plants as well, no matter how much we watered. Great idea! I guess the same principle can be used to make a cold frame for a small garden, or a smaller green house of course. I love the self watering aspect! Awesome!! I want to try this so bad!!!! Saying that building the frame out of wood is Green doesn't make much since IMO. Wood is by nature GREEN. It is replenish-able, certainly PVC or Metal conduit wouldn't be GREEN. Maybe bamboo would be a good alternative as it is faster growing than most construction grade woods. If you've got someone that's handy with a chain saw you could have them split a small log for the use of framing.. I was thinking if you cap the bottom bottle and stack them and turn the bottoms upward and catch the rain in the bottles it would create more heat when warmed by the sun. Would this last long enough to justify the time and trouble? Seems like these plastic bottles become very brittle very quickly, especially with outdoor exposure. You say trees have to be cut for the frame, why not use PVC pipe. My greenhouse is all plastic, frame and cover which is double bubble wrap. Held in place be plastic tape. I know i'm still a little "green" about all this house building. Great idea but I don't think I would have the patience for it. Wow What an idea to upcycle plastic bottles. If we made them bigger they could be shelters for the homeless. I would live in one. They would be warm. This has great easy to follow instructions. Maybe the frames could be pvc pipes. The pipes could be drilled out and the cane poles would fit right into the holes. well I think we are going to find out how well it will stand up to extreme sun and heat I live in buckeye Arizona we've been known to easily have 115 to 126 degree summers so after I can get one built which will take me a little while to do since it will be only me building it. i'll let u know jus how well it will stand up against our scorching summers I'm jus hoping it doesn't wilt melt or combust from built up heat trapping in bottles over time . I've seen many things out here heat pressure explode from tires on parked cars the huge glass trunk window on my parked Trans am trash cans to bottles. so this could interesting if the ends heat seal to the inner lock bottles.. guess there's only one way to find out build it way Frm house and see what happens over time. I'll keep u posted if goes well or not. if anyone else lives in harsh place like mine and worry bout that u can always drill 1 small hole in side of bottles on the inside of green house. I've seen plastic bottles out here worp & melt together so I have 50/50 it could go either way but I'm a risk taker & not gonna drill vent holes . Hey very cool website!! Guy .. Excellent .. Wonderful .. I’ll bookmark your website and take the feeds also?I am satisfied to find numerous useful information here within the post, we want work out extra techniques on this regard, thank you for sharing. . . . . .
Good information for people recycling their bottles into a greenhouse! Thanks. I've been collecting bottles for about a year and a half, from personal consumption and a few parties. Stored some in my shed, but soon had too many. Began putting them in big garbage bags and storing them under the shed. Decided to go ahead and remove labels and bottoms of the bottles as I collected them, so I could fit a few more in each bag. Discovered wind can blow a bags of empty plastic bottles from under a shed, and sprinkle both bags and bottles all over a lawn. Weather weakens the bags, too. Decided to go ahead and string them like beads on some clothes line. It takes 10 bottles to make a column 8 feet tall. It takes 3 columns side by side to make a panel a foot wide. So to make a 4X8 panel, the size of a sheet of plywood, one bottle thick it takes 120 bottles. Interesting in theory, but there is nothing 'less green' about using wood for a frame if it comes from a sustainable source, or reclaimed wood is used. Our kennel is built out of my fathers old garden shed, which started life 50 yrs ago as a henhouse. Not green? It's first time I see a greenhouse like this. It's awesome. Have for sure i'll do it. Very cool Thumbs up and shared on FB! This was such a great tip. Nice job! Fantastic idea, I'm a great one for recycling and love my plants too, I shall try this on a scale to suit my small garden. Thank you so much for the information. This greenhouse made of bottles is awesome, the type of bottles that I frequently use are much bigger, I wonder if they could be used the same way and what it would look like. I think is one kind of creativity and really suitable for good environment. plastic bottle is dust after use but is not dust.Really awesome idea for good environment . It seems like if you could arrange it so that you didn't have to cut the bottom or top off and filled it with some clear liquid that wouldn't evaporate (I'm not sure what that would be), that would add insulation. If you added water and glued the lids back on, would the water evaporate? I am not a scientist as you can tell, but surely someone could come up with something. What an excellent idea, and depending on how many plastic bottles are available, a community garden group could probably build more than one. I'm pinning this and showing it to my local garden group so we can start collecting those bottles. This is something that I'm sure we could do, especially since we have to buy water for drinking. Pinning this for sure. Thanks for bringing this idea to our attention. Very useful and interesting! Cool!!! That is a very neat idea. I love the way you gave step by step instructions on how to do the project. It is very useful, teacher kids about the environment and is very eco-friendly. I look forward to more of your blogs! AWESOME! A really great idea.. since summer is almost over, I am going to try to find a free greenhouse for myself! Well done you and welcome to Hubpages! No worries if you have similar hub. This one's already copied all over the web so it's been downgraded :( good luck with yours! Nice hub, i'm new here being a squidooer, but as squidoo had sold out to hubpages my plastic bottle greenhouse page will be transferring over. I built one 5 years ago and have recorded its progress since. Ongoing info about how well it works, and what I grow. Wow I will now start collecting plastic bottles, but it will take some time since we mostly have glass bottles, unless there is a way to do it with glass bottles? Its the cutting that would be a great deal of work I recon he. Great hub! 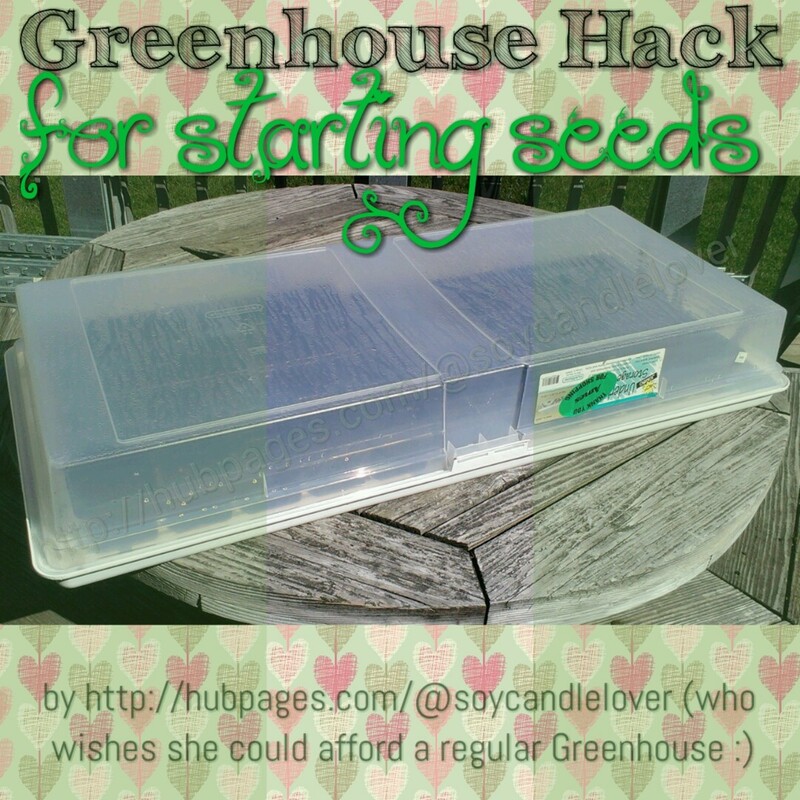 I will try the idea in a small sample for the seedlings. This is a great idea and a great article. I will start mine after the home construction/remodeling is finished. 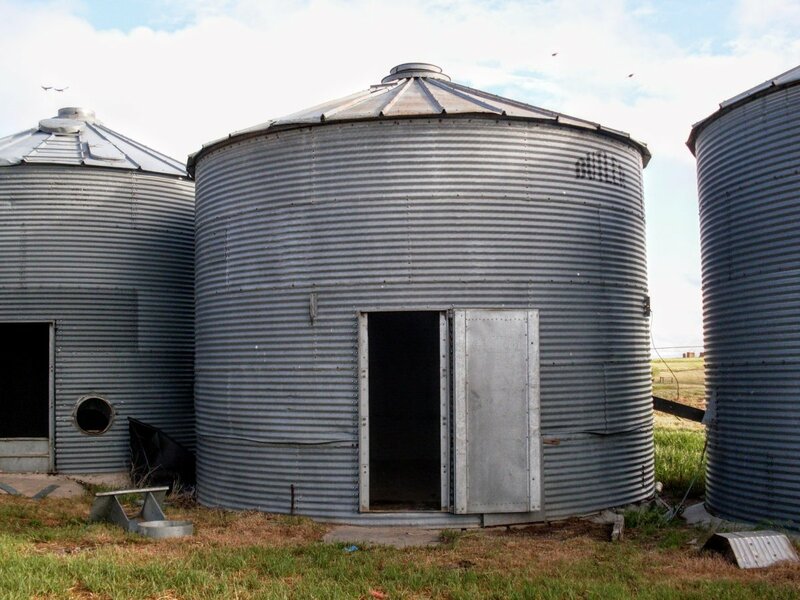 I have a large storage shed, (12X20), and an acre of land. Awesome hub by the way! Your seedlings will need light. I would honestly start them off elsewhere and put them into the greenhouse at the height of summer. I imagine the summer sun in France would be too hot for them. and a green shaded greenhouse will help keep them cool. The other thing you could do is build your greenhouse with green bottles, but make sun windows with clear plastic bottles and place your seedlings under them? Thanks for the reply IzzyM. Another question though...would there be enough light inside the greenhouse to start seeds in spring, as the bottles are a quite dark green colour? I've read that one needs a grow light? No problem with heat I think, as it gets very hot in France. I don't see why not. It would just be like having a shaded greenhouse! Couls I use green bottles for this project? Guess I'm coming to this hub a bit late, but, you say in it that you would like to have a construction without a wooden frame. 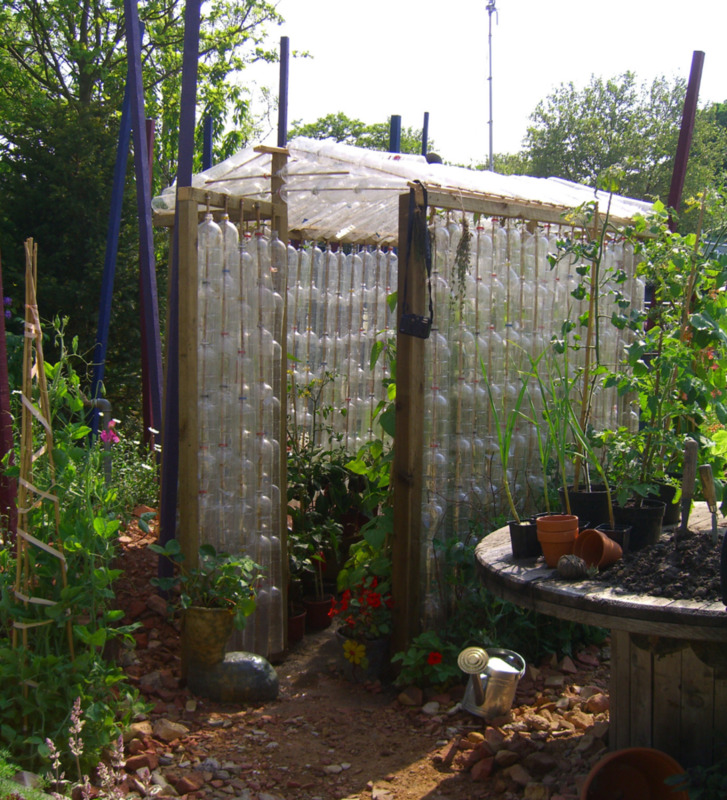 Thinking about it, I reckon you could construct a bottle greenhouse in a similar manner to a polytunnel. The bottles could be formed into a curved frame, replacing the 'scaffolding poles'. creating the semi-circle by utilising flexible cane similar to that used in pop-up tents - there must be a better way, though. This could be continued all the way down the length - this way the construction could be as long as you require. 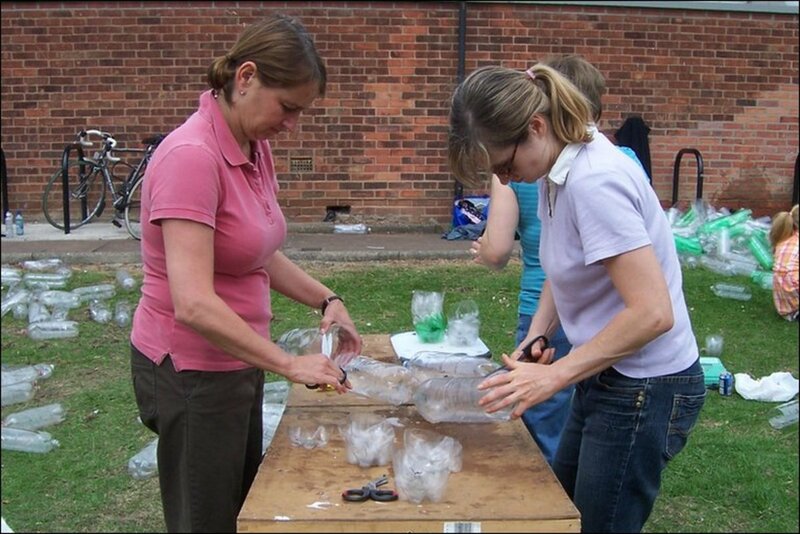 Otherwise use straight sections of bottles to join a number of curved sections together, and then cover with polythene, or bubble wrap. The ends could be constructed as per your instructions, or they too could be covered with plastic / bubble wrap (in two sections, so that one can gain access). Hope I've explained this so you can understand what I have visualised in my mind. If I had a garden I'd try this for myself. I accustomed to receive on top of living yet as of late We've accumulated some sort of resistance. The city has a blight ordinance, the wording is such that if they don't like it, they call it blight and you have to remove it or they fine you. I already did a few rounds to keep my artwork on my garage door. I have seen them make people get rid of the old tire flower pots from their yards because they where used tires and against code. I don't see how the city could object - it's not a permanent structure though it should last a few years. Good luck! Kewl idea. I doubt my city would let me have one but it would be worth finding out. I love my little veggie garden and I could see protecting it with one of these. I too think this is a great idea. I was thinking like you suggested in a previous comment this idea could be used on a smaller scale for frost tender areas of the garden etc. So many uses - great! Holy cow, I am speechless. That is amazing. What a money-saver, planet-saver, and so good for the plants, too. Unbelievable, that's for sharing this great idea. VU & everything! Thanks guys, that is a big help to me, as Google has never really sent any traffic to this hub, and so it depends on social traffic only. This is a very Cool hub, and I'm so happy you included pictures! voted up and shared! I think that this is a wonderful idea and I am going to remember this. Thank you for sharing!! Brilliant - I think good to use plastic water bottles and not promote fizzy drinks because they are really bad for you!! But excellent blog and might well have a go. Many thanks, Kasman! Collecting bottles takes the longest time, so it might be an idea to start now, even though you are not ready to construct the greenhouse. Of course it doesn't have to be a free-standing structure. The choice is yours, it could be a lean-to, a mini-greenhouse, a covering for a raised bed garden, or many other potential designs. PET plastic is top-grade and will withstand almost anything so should last for years. This is one of the best greenhouse construction hubs I've seen yet. My wife and I are planning on building one here soon but we had never considered using bottles. I think I'll have to save this hub in my bookmarks. I'm seriously so thankful you did this. Voting this up and very useful personally to us. You're welcome :) It's a lot of work, but it is free. This is really cool! ^_^ Want to try this in the future... thank you for sharing this idea. Thanks Elias! It would be wonderful to think that this hub inspired loads of plastic bottle greenhouses to be built. What a saving for the landfill sites! wow! that's a really wonderful idea! thank you, IzzyM, for the wonderful hub! Voted up& awesome+shared! Cheers! Yes but every time I check, there is a new one up! Everyone seems to want to copy this hub instead of writing their own. Have you been able to get the copies squashed? I think Mary must have shared it. Thanks Mary! This article has never gained search engine traction, it's always Social traffic, so thanks all who share! Oh and it gets copied all the time, which is probably one reason Google hates it (though they seem to rate the copiers higher than this one). I've got a pretty large collection of plastic bottles out in Spain for my greenhouse project, if I ever get it finished. What a coincidence! Only a few minute ago I was telling Beth about this very hub and it popped up on my feed! lol! What are the odds of this happening? lol! I learn something new every day here on HP! As a gardener, I would love to build one of these greenhouses. Great article. I'be bookmarked it for future reference. I would love to make one these for a greenhouse. What a wonderful idea and very interesting. Great hub. Fantastic hub I would love one of these. My council had one at their nursery but then they closed the nursery! I would love this but might be limited in room ....maybe my wee 4 shelf thing could be adapted though as the cover has split...you have me thinking now! Wow Izzy, that is awesome. Not in a million years would I have come up with that wonderful idea. Thanks to all the commenters for the vote up, and especially for the sharing. @Jim, thanks for the advice! I do tend to get carried away sometimes with my own enthusiasm, and will take time to go through the hub and correct punctuation and sentence length - you are right, I do tend to write long sentences and it's a bad habit. I'd drink to that! Your greenhouse project scores high on so many levels--recycling, waste stream reduction, organic gardening, community building to mention but a few. I thoroughly enjoyed reading this Hub and gladly share it with my Facebook friends. Now, if I may be allowed a bit of critique, the conversational style of your writing is quite engaging and enjoyable, as if you were standing next to me and telling me about this project. Your enthusiasm shines through brilliantly. I would suggest you pay closer attention to your punctuation, particularly on the use of commas, as your sentence structure tends to be rather lengthy. Great idea in this age of recycling! This is the ultimate "green" project. 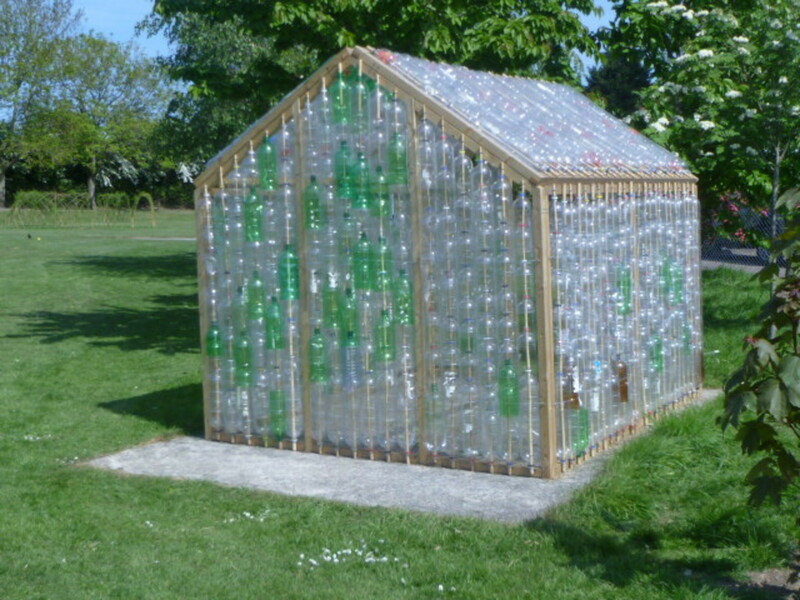 I have heard of using plastic bottles to make a greenhouse. Thanks for sharing all the steps! What a wonderful way to reduce waste in our landfills and have the benefit of a longer growing season! Pinned and voted up! Up, Useful, Interesting, and shared with followers and on social networking sites. One of these years if my thumbs turn green I'll participate at a community garden, and making a communal greenhouse for it together out of soda pop bottles might be a helpful and welcome idea. Thank you IzzyM for getting back to me and I see now and I completely agree with you, it is indeed a great project. The gaps make for great natural watering when it rains! If winds are the problem, the greenhouse can be insulated with bubble-wrap. Even so, if the basic structure is well anchored, the plants inside are still sitting happily at several degrees above the outside temperature. This idea will never be better than a proper greenhouse, but it's a cool project, especially for community groups. This is a great idea and I also love the video. I noticed that there were gaps in the green house and wonder how that affects the green house. Thanks very much! I've long used the tep liyer soda bottle, with the bottom removed, as a cloche to protect young plants. This goes way beyond that. I am definitely considering this as an ption for a summer project. This is interesting! It is amazing that plastic bottle can be useful for many things including making creation like this. It's such a shame to throw such a high grade of plastic away, and that is great to know they won't biodegrade in high UV areas. If they withstand the heat in Brazil, they'll be fine in southern Europe (which was what I wanted to know for certain). What a great idea. I have never seen anything like it. We use plastic bottles here in Brazil. On our tilapia farm we use them as floats in the lake. We suspend air diffusers from them. I have also seen them used here in family gardens to keep birds away. Our UV index is in the 'extreme' category and have had no problem with them cracking.